Rhazel Akoben – Graduate of The Horizon Institute. His focus is Business Development and Community Enrichment. During his studies, he founded Build Today, Lead Tomorrow which is focused on providing leadership/communication skill building and erasing the digital divide by teaching coding to Chicago’s Westside youth. 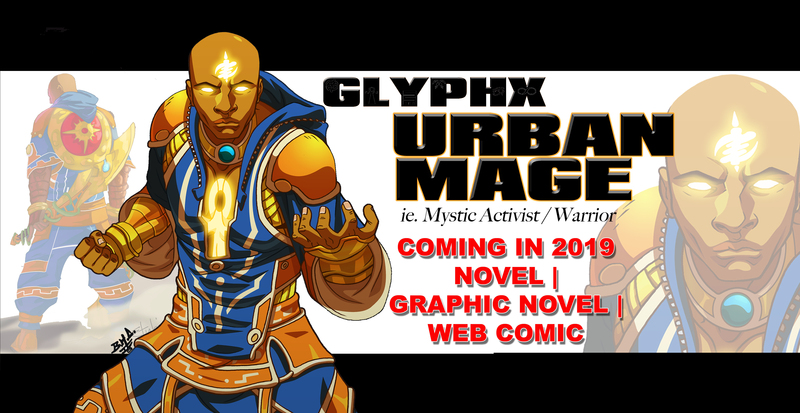 He has been empowered with The Ascension Equation; given mystic powers (Soulcery); he defends Earth’s Realm as GlyphX The Urban Mage. Malcolm Garvey –Rhazel’s childhood friend. His focus is Business Technology and erasing the Digital Divide with teaching Coding to the Youth. He becomes suspicious of possible supernatural elements; based on what he’s been through. Ashaki S. Estrella – Older Sister to Asadah. The Horizon Institute Graduate. Ashaki and her younger sister, Asadah S. Estrella are focused on building their communications company called ASE2 Experience. Thaddeus Goldstein – The Horizon Institute Graduate & program partner of Rhazel. Born to semi-rich parents. Not interested in Family business, so decided to create his own way without his Father’s support. His focus is documentary photography / videography.